Herbal decoctions and infusions can be great to rebalance the hair's pH after washing or after being in drying elements (outside - summer or winter). These plant extracts, nourish dry hair with its various vitamins and mucilage. This site has some good notes on herbs that are great for dry hair and natural highlights! 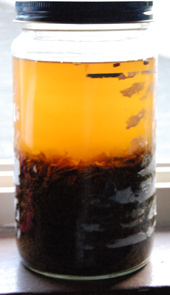 Infusions are what we are familiar with also known as tea, in a larger amount. These are best suited for leaves, flowers, and seeds. Be sure to place a lid atop the steaming herbs, to make sure those important essential oils don't escape, and take away from your benefits. How do I make an Infusion? This is as easy as making tea! A standard amount is 1 ounce herbs per quart (large mason jar) of water. 1. Boil some water. I usually like to wait 1 minute, before pouring the water, so that it doesn't kill all the nutrients. 3. Pour water over the top and place lid atop, I wait until it has cooled to screw it tight. Allow it to sit for 15 minutes or longer, depending on how strong you want it, and how much time you have. 4. Optional, place in the sun for synergy! Decoctions are especially helpful in breaking down tougher parts of plants, such as roots and stems, in order to release the nutrients by simmering them. This process makes the nutrients available for you to use. How do I make a Decoction? Measure out quart of water (I use a glass jar). 3. Place the herbs in saucepan and bring to a boil. Reduce down to a simmer, and simmer for 15 mins or longer. 4. Pour into a jar with a strainer atop and use. Don't forget to refrigerate leftovers within 12 hours. Note: I will do an article on Burdock, Jasmine, and Peppermint soon. They are all good for the hair. You can make your brews from herbs of your choosing, as well as, add in some spices, such as rosemary, that are good for the hair too. How do I apply these brews? You can spritz on your hair, drink them, or do a herbal rinse to help you cool down during this hot summer we have been having. :) I love it, when I can feed two birds at once! Also, be sure to pH balance your brews when using them for the hair. It is pretty simple, and entails adding a small amount of fruit based vinegar to achieve the best hair pH. These deep brews are filled with vitamins, minerals, and nutrients. These herbal hydrators help to quench the thirst of dry hair, by supplying much needed nutrients to those hair strands. You can replenish inside and out (except with comfrey), during extreme temperatures - excess heat, excess cold. Have you made a brew yet?